Ambassador Dennis Ross is Counselor and William Davidson Distinguished Fellow at The Washington Institute for Near East Policy. For more than twelve years, Ambassador Ross played a leading role in shaping U.S. involvement in the Middle East peace process and dealing directly with the parties in negotiations. A highly skilled diplomat, Ambassador Ross was U.S. point man on the peace process in both the George H. W. Bush and Bill Clinton administrations. He also served two years as special assistant to President Obama and National Security Council senior director for the Central Region, and a year as special advisor to Secretary of State Hillary Rodham Clinton. He was instrumental in assisting Israelis and Palestinians to reach the 1995 Interim Agreement; he also successfully brokered the 1997 Hebron Accord, facilitated the 1994 Israel-Jordan peace treaty, and intensively worked to bring Israel and Syria together. Ross is the author of several influential books on the peace process, including Myths, Illusions, and Peace: Finding a New Direction for America in the Middle East, coauthored with Institute peace process expert David Makovsky; The Missing Peace: The Inside Story of the Fight for Middle East Peace (Farrar, Straus, and Giroux, 2004), which offers comprehensive analytical and personal insight into the Middle East peace process; and Statecraft, And How to Restore America’s Standing in the World (Farrar, Straus and Giroux, 2007), which the New York Times praised as “important and illuminating.” He is the author of the recently released book, Doomed to Succeed: The U.S.-Israel Relationship from Truman to Obama (Farrar, Straus, and Giroux, October 2015). Ross takes us through every administration from Truman to Obama, throwing into dramatic relief each president's attitudes toward Israel and the region, the often tumultuous debates between key advisers, and the events that drove the policies and at times led to a shift in approach. 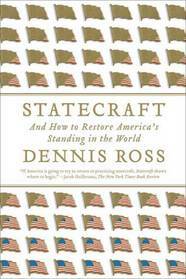 In this wise and thought-provoking book, the renowned peace negotiator Dennis Ross shows that America's current foreign policy problems stem from the Bush administration's inability to use the tools of statecraft to advance our national interests. 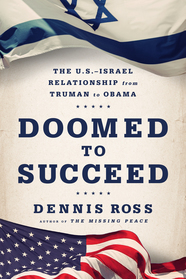 The U.S.-Israel Relationship Based in part on his latest book, Doomed to Suceed, Ross discusses America's changing relationship with Israel and the role he played in shaping U.S. policy toward the Middle East, and Israel specifically, for nearly thirty years. International Security A scholar and diplomat with more than two decades of experience in Soviet and Middle East policy, Ross examines the most pressing issues facing Russia and the Middle East today. "Ambassador Dennis Ross has a wealth of information about the Israeli- Palestinian conflict and the various peace negotiations which have taken place over the past three decades, all of which he presented, without notes, lucidly and eloquently. His presentation was learned, informative and insightful. He is an engaging speaker, and our standing room only audience was completely enthralled by him." "On behalf of the leadership of the Marcus Jewish Community Center of Atlanta and the co-chairs of the Book Festival, please accept our most sincere thanks for what was certainly one of our best programs in recent memory. We have received only the most positive feedback from our audience about your incredible depth of knowledge on the Middle East, European politics and its state of affairs, and your involvement with the past four presidential administrations. Your ability to articulate subjects that are often complicated to understand is truly a gift to our community."